In Germany, targeted wage subsidies to employers are an important instrument of active labor market policy. This paper compares the wages of individuals taking up a subsidized job with those of otherwise similar individuals who found an unsubsidized job, combining propensity score matching with a differences-in-differences strategy. The results indicate for the short-run that subsidized jobs are not associated with gains or losses regarding daily wages. Nonetheless, because subsequent employment rates of subsidized persons are higher on average, we find a positive relationship between cumulated wages and subsidization. The online version of this article (doi: 10.1007/s12651-010-0029-3) contains supplementary material, which is available to authorized users. Eingliederungszuschüsse sind zeitlich befristete Lohnkostenzuschüsse, die Arbeitgeber bei der Einstellung von Personen mit eingeschränkter Vermittelbarkeit erhalten können. Dieser Beitrag nutzt Prozessdaten der Bundesagentur für Arbeit, um die Arbeitsentgelte von Personen, die mit einem solchen Eingliederungszuschuss gefördert wurden, mit denen ähnlicher, aber ungefördert eingestellter Personen zu vergleichen. Die Ergebnisse zeigen, dass geförderte Beschäftigungsverhältnisse kurzfristig im Mittel weder mit höheren noch mit geringeren Tagesentgelten einhergehen. Da geförderte Personen jedoch in der Folgezeit mit höherer Wahrscheinlichkeit beschäftigt sind als vergleichbare ungeförderte Personen, fallen ihre kumulierten Arbeitsentgelte über einen längeren Zeitraum betrachtet höher aus. Targeted wage subsidies are tailored to particular groups of unemployed persons and typically granted for a limited period of time. They temporarily reduce a firm's labor costs for hiring and employing previously unemployed persons and can thus trigger the placement of such persons into jobs. To motivate a firm to hire a particular unemployed person for a particular job, a period of subsidization might prove helpful for several reasons: First, a worker's skills might not match the requirements of a job, but the mismatch is expected to diminish with training on the job. Second, a period of subsidization reduces an employer's uncertainty about a job applicant's productivity and thus serves as a screening instrument. Third, institutional factors such as minimum wages or collectively negotiated wages might drive a wedge between individual productivity and wages. Of course, the longer term effects of the subsidy depend on the issue whether the gap between the expected returns and costs of employment to the firm can be closed during the subsidization period. We are interested in the wage effects of targeted wage subsidies, which cannot be predicted ex ante. For instance, studies of three North American programs obtained quite different results: In the short-run, Hamersma (2008) found that 40% of subsidies were passed over to workers as a wage premium, while no effects could be found on cumulated wages over a longer time period. In contrast, Dubin and Rivers (1993) showed for the short-run that wages were lowest for workers participating in a wage subsidy program, while Brouillette and Lacroix (2008) obtained a similar result for cumulated wages. During the actual subsidization period, subsidies may provide opportunities for rent sharing, thus subsidized workers might receive higher wages than similar unsubsidized workers. Otherwise eligibility for a subsidy can be interpreted as a negative signal and stigmatize workers, thus incurring comparatively low wages. In the longer run, employment rates of previously subsidized workers may differ from those of unsubsidized workers, which will have an impact on cumulated wages. In Germany, an employer could be asked to reimburse part of the subsidy if he dismisses a worker during a “protection period” (that encompasses the subsidization period or an obligatory follow-up period of the same length): Firms may tend to dismiss previously subsidized workers immediately after the expiration of this period. Otherwise this period can provide sufficient time to increase productivity through learning-on-the-job and thus prolong job duration. Our study presents first evidence on wage rates received by participants in a German wage subsidy program as well as on their cumulated wages. In Germany, targeted wage subsidies paid to employers are an important instrument of active labor market policy: During 2003, more than 180,000 subsidized jobs were taken up. While the number of entries into the program decreased to 134,000 in 2005, afterwards they increased again, up to around 250,000 in 2007 and 2008. Transitions into subsidized jobs accounted for roughly 3% of all transitions out of unemployment in Germany during 2004 (Rothe 2007). Within our sample of medium-aged unemployed persons entering employment during the second quarter of 2003, as much as 6% of all transitions out of unemployment into employment were subsidized. In particular, we ask whether workers taking up a subsidized job during the second quarter of 2003 experienced wage gains or wage losses compared to otherwise similar, but unsubsidized newly hired workers. The wage question is of political importance, because wage subsidies are by German law intended to compensate employers for a temporarily reduced productivity of subsidized workers. Thus, if we observe wage gains or losses of subsidized workers this could be a hint on unintended effects of the program. To compare wages in subsidized and unsubsidized jobs, we combine propensity score matching with a difference-in-differences strategy. We show that subsidized workers in Germany receive daily wages that are not significantly different from those of similar unsubsidized workers. In contrast, taking into account that the subsequent employment rates of participants are higher, we find significant higher cumulated wages of (previously) subsidized workers during our observation period of 3.5  years. We interpret our finding of similar daily wages in the light of the German system of industrial relations: In Germany, collective contracts (still) play an important role for wage setting, and wages are usually attached to types of jobs rather than to individual workers. This implies that different wages for subsidized workers within similar jobs compared to unsubsidized workers might be perceived as unfair and not acceptable by workers and firms as well as by caseworkers of the Public Employment Service. Furthermore, wage undercutting might be infeasible, because subsidized jobs are on average rather low-wage jobs. Higher employment shares of previously subsidized workers – the underlying reason for higher cumulated wages – are probably related to the design of the subsidy: The “protection period” seems to be sufficiently long for many (previously) subsidized employees to catch up any productivity deficits that might have existed when taking up the job, or to invalidate ascribed productivity deficits. In particular the results on cumulated wage effects (resulting from differences in subsequent employment shares) are subject to several qualifications: Our approach ignores that the subsidy might have been essential for the hiring decision (which probably underestimates cumulated effects of the subsidy on wages). But it assumes that estimated higher employment shares of previously subsidized workers are in fact a result of subsidization, or of the “protection period” associated with the subsidy. However, although our analysis controls for a number of important firm-related features, we cannot entirely rule out that further (unobserved) selection processes of workers into firms took place. Furthermore, the analysis restricts itself to the estimation of direct effects of the subsidy on participating workers and does not take into account possible indirect effects (such as for instance effects on reservation wages, or substitution of unsubsidized workers through subsidized ones). In the following, Sect. 2 provides a literature review on theoretical aspects and on the empirical evidence, while Sect. 3 presents details on the program analyzed. Section  4 provides information on the data set and Sect. 5 depicts the econometric strategy. Section  6 presents the empirical results. This paper analyses the short- and long-run wage effects of targeted wage subsidies, covering a share of labor costs and paid to employers for a fixed period of time. This Section gives a short overview of theoretical models that provide insight into the wage and employment effects of subsidies, and of the empirical evidence from different countries. Because of different designs of wage subsidy schemes and different labor market institutions across countries, however, there is no a priori reason to presume that estimated effects should be similar across countries. Usually, models incorporating wage subsidies assume that subsidies are paid permanently and abstract from potential productivity enhancements through learning-on-the-job. In simple static models, a wage subsidy paid to employers is treated as a cost reduction of labor (Bell et  al. 1999). If subsidies exceed productivity deficits of subsidized workers they lower total factor costs. If these are not passed on to consumers through a reduction of prices, the subsidy shifts the labor demand curve upwards. Employment as well as the wage rate increases, while the size of the effects depends on the elasticity of labor demand and supply. In case of a binding minimum wage, a wage subsidy might induce firms to hire more workers just at the threshold, without actually increasing wages. In contrast, from the firm's viewpoint an in-work benefit paid to employees can shift the labor supply curve downwards. An adverse direct effect arises, however, if employers perceive eligibility for a subsidy as a negative signal, which stigmatizes workers. Recent theoretical literature on wage subsides is mostly based on search or matching theories (Mortensen and Pissarides 1994). Within this branch of the literature, an important distinction has to be made between general wage subsidies – paid to all low-wage workers – and targeted wage subsidies or hiring subsidies that are tailored to particular groups of unemployed persons. In addition to developing their own models, Brown et  al. (2006) as well as Jahn and Wagner (2008) summarize the comprehensive literature in this field. An important feature of most studies is that wages are the result of a Nash bargain and that part of the subsidy is handed over to workers through rent sharing. For instance, Hamersma (2008) formulated a search model with a minimum wage, targeted wage subsidies (paid for an unlimited time period) and uncertainty on the productivity of a worker–firm match. Her main result is that employment is higher for subsidized workers and their wages increase above the minimum wage at lower levels of productivity than for unsubsidized workers. Thus, subsidized workers receive higher wages than unsubsidized workers of the same ability. The effect of the subsidy on tenure remains ambiguous, however. On the one hand, subsidized workers are less productive; on the other hand, the subsidy decreases the risk of ending the employment relationship. Mortensen and Pissarides (2003) draw attention to the fact that, in a dynamic setting, hiring subsidies could also encourage firms to terminate jobs sooner to take advantage of the subsidy from new job creation. Targeted wage subsidies might also have indirect effects on nonparticipants. They reduce the relative costs of particular workers, thus they should at the same time incur a substitution for relatively more expensive factors of production (such as other workers and capital). Furthermore, some of those subsidized might have been recruited anyway at the same wage, inducing deadweight losses. Calmfors (1994) highlighted also that the labor supply or wage-setting curve, respectively, can shift upwards as well, if wage subsidies are quantitatively important enough to lessen labor market pressure. Adda et  al. (2007) draw attention to the fact that the availability of wage subsidies might have an impact on the behavior of unemployed persons. A widespread use of subsidies might decrease the incentive to accept an offer for a lower paid unsubsidized job and increase an individual's reservation wage, thus prolonging individual unemployment duration. Empirical evidence on the wage effects of targeted wage subsidies is rather sparse. In Sweden, temporarily subsidized jobs offer an opportunity to acquire job-specific human capital; the decision to join a program is made jointly by the unemployed person and his or her caseworker. Adda et  al. (2007) presented descriptive evidence for a sample of young workers that those subsidized earned (conditional on employment during an observation window of around two years) 3.5% more than other previously unemployed workers. However, these results do not account for the dynamic selection process into programs. The authors thus developed and calibrated a structural model, which showed that subsidized jobs increased earnings very moderately and by less than half the amount that participation in a regular job did. They speculated that subsidized work may contribute less to human capital formation than regular work. Furthermore, the opportunity of program participation might have raised the reservation wage for the treated group and have delayed their entrance into employment. For the State of Wisconsin, Hamersma (2008) analyzed the “Work Opportunity Tax Credit” and the “Welfare-to-Work Tax Credit.” The subsidy applies to members of certain disadvantaged groups and long-term welfare recipients, respectively. For both programs, employers have to apply in writing at the State Employment Security Agency and – if eligibility of applicants or new hires has been certified – claim the time-limited subsidy that covers a share of the wage costs on their federal tax return. Hamersma estimated the effect of these subsidies on wages and tenure of subsidized workers, using propensity score matching to select a comparison group of eligible, but not certified workers. As a result, she found significantly positive effects on wages in subsidized jobs during subsidization – in the short-run (during the first quarter of employment), around 40% of the tax credit was passed through to workers in the form of a wage premium. Long-run effects on cumulated wages and effects of participation in a subsidized job on tenure were insignificant, however. In a companion paper, Hamersma (2010) showed that those firms where a larger fraction of workers reached certain job-duration thresholds were more likely to apply for a tax credit. Dubin and Rivers (1993) presented results from an experiment where randomly selected unemployed persons had the opportunity to place a subsidy voucher. During the quarter after claiming the subsidy, wages were highest for unemployed persons that refused to participate, followed by the control group; wages were lowest for those who actually used the voucher. They explain this result by self-selection of experimental participants – subsidies were typically refused by high-wage earners, who were reluctant to identify themselves as beneficiaries of the government. In a recent study, Brouillette and Lacroix (2008) obtained similar conclusions. They analyzed the Canadian “Self Sufficiency Project,” where previously randomly selected unemployed persons, who then became eligible (after  12  months of unemployment) and qualified (through taking up a full-time job within  12  months after establishing eligibility), received a generous in-work benefit (a subsidy paid to the employee). They analyzed the average wage during the six years after random assignment, conditional on employment, and showed that participating treatment group members earned less than control group members – but only some of those who were assigned to the treatment group actually participated in the program: In particular, individuals with a low expected wage rate had an incentive to participate in the income supplement scheme, assuming they received an offer, whereas those with high expected income did not participate. A large number of studies have estimated the impact of targeted wage subsidies on the employment prospects of participants, compared to unemployed nonparticipants. Most authors constructed comparison groups of similar, but non-treated individuals using statistical matching techniques and non-experimental data. For Germany, Jaenichen (2002, 2005) and Jaenichen and Stephan (2009) used this approach to analyze the same wage subsidy schemes that are investigated in this paper. They showed that participants had much higher subsequent employment rates than similar unemployed persons, who did not take up a subsidized job. Likewise, evidence for Britain (Dorsett 2006) and Sweden (Sianesi 2008; Carling and Richardson 2004; Fredriksson and Johansson 2008; Forslund et  al. 2004) suggested that wage subsidies had a positive effect on employment probabilities of the participants. Turning to the few results from social experiments on subsidy vouchers, Burtless (1985) found that unemployed persons with a voucher were less likely to find employment than job-seekers without vouchers. However, Dubin and Rivers (1993) obtained an increased probability of reemployment for the treated groups, when taking self-selection into account for voucher usage. Card and Hyslop (2009) analyzed the Canadian Self Sufficiency Project Applicant Experiment, where randomly selected long-term welfare recipients were offered a generous in-work benefit for taking up a full-time job after one year of social assistance. They found that the program increased welfare participation in the first year after welfare entry and lowered it over the following five years. Boockmann et  al. (2007) investigated the effects of changes in the legislation regarding German wage subsidies and concluded that increases in subsidized employment were mostly absorbed by deadweight losses. Similar to the effect of subsidies on wages, rather few studies concentrate on the effect of subsidies on tenure. For West Germany and for the same subsidy schemes that are investigated in this paper, Ruppe (2009) found that previously subsidized employment relationships went hand in hand with higher survival rates and longer tenure. Some studies applying duration models focus on the Belgium labor market: Cockx et  al. (1998) conducted comparisons of subsidized and non-subsidized individuals taking up a job, utilizing data from firms on their last five recruitments. They found positive, but insignificant effects of the subsidy on job tenure. Göbel (2006, 2007) analyzed the effects of subsidized employment on labor market transitions of young long-term unemployed workers. His main result was that participation in subsidized employment had a positive effect on the duration of the first employment spell, in particular during the first year of participation. Our study jointly analyzes two similar variants of a wage subsidy program to employers – called “Eingliederungszuschuss” – that were in place in Germany during the period 1998 to 2003. The first variant was characterized by a lower level of targeting, compensating for special training requirements, while the second variant was aimed at hard-to-place unemployed with severe problems of reintegration. The subsidy for training requirements could be granted for up to 30% of monthly wages for up to  6  months, while the subsidy for hard-to-place persons could regularly account for as much as 50% of the monthly salary and continue for at most  12 months (these limits could be exceeded in exceptional cases). If a subsidized person had been dismissed within a “protection period” (during the subsidization or a follow-up period of the same length) for reasons attributable to the employer, the employer could be asked to reimburse part of the subsidy. A subsidy could not be granted if the worker had previously been regularly employed at the firm applying for the subsidy during the last four years, or if another employee had been dismissed to hire a subsidized worker instead. Contrary to much of the US experience, wage subsidies in Germany were not granted through vouchers during the time period under consideration. Instead, caseworkers in local employment agencies had latitude in the allowance decision as well as in the fixing of the amount and duration of the subsidy. Most often, employers took the initiative and negotiated with the local labor market office over a subsidy to be granted, if hiring a particular unemployed worker (ZEW et  al. 2006, p.  53  ff.). However, caseworkers also might have offered a subsidy for particular worker–job matches, if a firm had asked the local labor market office for applicants. Furthermore, caseworkers might also have promised unemployed persons that they would grant a subsidy, if they obtain a job offer, as an instrument of self-marketing during job-search. In any of these constellations, the decision to support an unemployed person with a wage subsidy had to be reasoned in each individual case; size and duration should be determined by productivity deficits of the worker in the particular job. Hartmann (2004) conducted a comprehensive study of the importance of a wide range of wage subsidy variants for firms and their hiring behavior. Case studies of firms showed that firms often utilize subsidies to improve their competitiveness. On the other hand, flexibility requirements deterred firms from using subsidies and led them to hire marginal or part-time employees instead. Another point against wage subsidies occurred if firms could not predict labor demand in the longer run (p.  51 f.). On the basis of a firm survey related to 3,500 subsidized hires, Hartmann also tried to estimate the amount of deadweight losses by asking firms if they would have hired the same person without the support of a subsidy. For the programs under consideration in our study, firms answered that around  40 to  60% of subsidized persons would have been hired also without the help of the subsidy (p.  93). From these, around  20 to  30 percentage points would have been recruited anyway and have at the same time been suggested for the job by the caseworker. Generally, deadweight losses are smaller for workers with more severe obstacles to reintegration. Furthermore, firms revealed that the main integration problem of hard-to-place workers was not individual productivity deficits as such, but rather that firms ascribed productivity deficits to applicants that had been long-term unemployed or had little labor market experience (p.  147). In fact, the original assessment of productivity deficits had to be revised in a considerable number of cases (pp. 198). These results are in line with findings of the implementation study from a survey of  34 firms, presented in ZEW et  al. (2005, p.  140 ff.). 28 of  34 firms answered that hiring decisions did not depend critically on subsidization opportunities. Furthermore, the surveyed firms tried to take advantage of subsidies mostly, if they were uncertain about an applicant's productivity. For our purpose it is important to know if the law or the Federal Employment Agency prescribes how low or high subsidized wages might be. Regarding the law, only wages up to the collectively negotiated or the local customary level, respectively, and up to social security thresholds could be taken into account when determining the size of the subsidy. Wages as such might be lower or higher from a legal perspective. But informally, a lower bound for subsidized wages seems to exist also: ZEW et  al. (2006, p.  55) reported from caseworker interviews that wage rates undercutting the local customary level by  20% or more are given as reasons to refuse the subsidy. Our own small-scale enquiries in the Public Employment Service showed that – while no written instructions are available – there seems to be a consensus that subsidies should not support wage dumping and that the subsidized wages should not be below the local customary wage level. Finally, the general institutional setting should also play a major role in determining wages of subsidized workers: During 2007 – in spite of a declining importance of collective contracts – still around  80% of workers in the German private sector were employed in firms at least applying collectively negotiated contracts in West Germany, while  62% were so employed in East Germany (Kohaut and Ellguth 2008). Unions try to standardize and compress wages between as well as within firms, in particular by attaching wages to job-grades (Freeman and Medoff 1984; Agell 1999, 2002). Importantly, German firms applying collective contracts usually do not differentiate between workers with and without union membership (although they are not obliged to pay union wages to non-union members). Furthermore, because collective wage contracts are much more important in Germany than in North America, they constitute reference wages which might be perceived as fair by many workers and might invigorate workers' sense of entitlement (Holden 1994; Gerlach et  al. 2008). Franz and Pfeiffer (2003) surveyed managers from about 800 firms and found that wage rigidities in German labor markets for less qualified workers seem to arise mainly due to collective contracts. To conclude, the ubiquity of collective contracts implies that lower or higher wages for subsidized workers than for unsubsidized workers within similar jobs might also be supposed to be less acceptable in Germany than for instance in North America – by workers and firms as well as by caseworkers. To investigate the wage effects of the subsidy variants under consideration, we utilize an excerpt from the Treatment Effects and Prediction data (TrEffeR) of the German Public Employment Service (Stephan et  al. 2006). The data cover the years 2000 to 2007 and combine data flows from the distinct computer-based operative systems of the Public Employment Service on periods of registered job search, registered unemployment, participation in labor market programs and employment. Even though the TrEffeR data set is not available for public use, it is composed of the same data flows as the Integrated Employment Biographies (IEB) of the Institute for Employment Research. Hummel et  al. (2005) describe an IEB sample that is open for public use through the Research Data Center of the German Public Employment Service. Because the TrEffeR data provide only sparse information on employment periods, we add information on the characteristics of the job – in particular on wages – from the employment history files (BeH) of the Institute for Employment Research (IAB). These files provide more detailed information on wages and on the establishment; they are based on notifications of employment to social security bodies. Daily wages are computed by dividing the entire payment during an employment spell by the duration of the spell in days (including days without work). However, there is an upper bound on the wage information at the social security thresholds. For the merged data set, we had to correct several smaller inconsistencies within and between both underlying data sets. Regarding the duration of subsidization, the data provide information on factual, but not on planned program duration. Regrettably, the data do not provide information on working times of individual workers, whether an employer applies a collective contract, on the individual caseworker involved and on mean tenure within firms. The sample underlying the estimates covers all individuals who entered full-time employment during the second quarter of 2003 after a period of unemployment, which lasted seven days to one year. Subsequent wages and employment of workers can be observed for a maximum duration of  3.5  years. Our analysis takes into account only individuals aged  25 to  49 at the beginning of this unemployment spell, since younger and older persons might be eligible for specific programs for their age groups. Furthermore, because temporary and short-term drop-outs out of unemployment may occur, we restrict our analysis to individuals who were not registered as unemployed for at least three months prior to the relevant unemployment spell (that ended during the second quarter of 2003). Individuals might have participated in other programs earlier during their unemployment spell. Among participants in the wage subsidy schemes, we excluded those exceptional cases whose subsidization period exceeded one year. Furthermore, we exclude those who had their last employment spell during the past three years within the same firm. While our sample is restricted to individuals entering a full-time job during the second quarter of 2003, these persons may also be observed in marginal employment or part-time employment at some points of time during the entire observation period, ranging from 2000 to 2007. When computing the wage outcome variables, we focus on nominal wages. We exclude all marginal employment spells and spells with a daily wage rate of less than  10  Euros from our analysis as well as further periods of subsidized employment. If we observe parallel employment spells, we pick out only the spell with the highest daily wage rate (another possibility would have been to add up wage rates at each point of time). Finally, the employment history files cover only information on wages subject to social security contributions – which excludes self-employment – and information up to the social security threshold. We abstain from imputing estimated wage rates for censored wages, because for our samples of treated and comparison persons wages very seldom reach the social security threshold of around 165  Euros per day. Instead, we exclude those – very few – individuals who earned a daily wage rate above this threshold during our observation period. Because wages usually are lower in East Germany than in West Germany, and lower for female compared to male workers, we present separate results by gender and region. Even though we display only findings from joint estimates for both variants of wage subsidies under consideration, we also conducted separate estimates for both variants and describe the results briefly. We are interested in the mean difference of wages between workers taking up subsidized employment during the second quarter of 2003 and otherwise comparable workers who started an unsubsidized employment relationship during this time period. However, we can expect subsidized workers to be a “negative” selection of all newly hired workers – otherwise they would probably not have needed a subsidy to obtain employment. Thus, comparisons of the full samples of subsidized and unsubsidized workers would reflect to a certain degree the selection of workers – influenced by themselves, by caseworkers and by firms – into subsidization. To account for observed differences between the two groups, we select groups of workers that are similar to the subsidized ones using statistical matching methods (Rosenbaum and Rubin 1983). We estimate a binary probit to estimate the probability to be subsidized for each individual taking up a job – the propensity score – and select a comparison group of newly hired unsubsidized workers such that the distributions of the propensity scores are similar for both groups of workers. The process-generated data that we use encompass a comprehensive number of variables describing individual and firm characteristics as well as the regional labor market. These variables should be crucial for the assignment process into subsidized employment as well as for the subsequent wage outcomes and can thus be utilized to choose a comparison group of individuals entering unsubsidized employment by means of propensity score matching. In detail, our choice of comparison groups is based on the variables described in Table 1, which are mostly categorized as dummy variables. Note that in several cases hiring subsidized as well as unsubsidized workers is directly preceded by a short-term training measure within a firm (see also ZEW et  al. 2005). While information on the firm where the training took place is missing in the data, it is sensible to assume that it took place within the same firm. Consequently, the dummy variable for firm-internal training has been coded to zero if such a training program took place directly within the month before taking up the job, because it can be regarded as part of the job already. Firm size class, sectoral affiliation, mean daily wage in firm (three categories), mean share of workers with university degree (two categories). In detail, we perform a radius matching (Dehejia and Wahba 2002) that matches participants with “synthetic comparison persons,” composed of a weighted equivalent of all persons falling within the radius of their propensity score, and apply a caliper – a maximum distance of propensity scores between treated and comparison persons – of 0.0005. Estimates are performed using the Stata module psmatch2 (Leuven and Sianesi 2003). Note that we conducted several robustness checks of our estimates and experimented with different calipers as well as different matching algorithms, and present those with a particularly good matching quality. However, our results regarding wage differences between the treatment and comparison group turned out to be very stable, regardless of the particular matching algorithm or caliper chosen. Daily wage when taking up a job during the second quarter of 2003. Average of daily wages, conditional on working, during the  3.5  years after taking up this job. Average of daily wages during the  3.5  years after taking up this job, assuming a wage of zero for times without regular employment, thus mirroring the development of cumulated wages. The difference between  1a) and the latest daily wage observed in the three years preceding the entry into the analyzed job, imputing a wage of zero if the worker has not been employed during this time period. The difference between  1b) and the average of daily wages, conditional on working, during the  3  years preceding the entry into the analyzed job. The difference between  1c) and the average of daily wages during the  3  years preceding this job, assuming a wage of zero for times without regular employment, thus displaying the difference in cumulated wages over time. Thus, we combine statistical matching with a difference-in-difference strategy. Compared to a standard regression analysis that simply controls for previous wages, this approach has two advantages: First, it does not make the linear functional form assumption that regression does. Second, matching avoids the identification of effects by projections into regions where there are no data points. The latter might be an issue because subsidized workers can be regarded to be a particular selection of all workers taking up a job. Finally, although we already account for several important firm characteristics in our propensity score estimates (as Ruppe 2009 shows, in particular sectoral affiliation is strongly correlated with tenure), firms that hire subsidized workers might be inherently different from firms that do not utilize subsidies. First of all, these firms may be in less need of external flexibility (which might be important in particular firms in the construction sector or temporary help firms). Second, closing temporary productivity gaps of newly hired workers by means of a subsidy might be appropriate for firms where learning on the job enhances productivity considerably. Third, firms with comparatively low settling-in costs may take the risk of hiring persons with an “unemployment stigma,” if this risk is reimbursed by means of a subsidy. Fourth, managers of firms hiring subsidized workers might have stronger social attitudes than managers of other firms. A feasible strategy would be to restrict the analysis to a sample of firms that hired at least one subsidized and one unsubsidized worker. However, while this tackles the problem of time-constant unobserved firm heterogeneity, another problem may arise: Within these firms, further unobserved differences between subsidized and unsubsidized workers may be prevalent: Otherwise, the firm would not have hired one person without claiming a subsidy.1 We present results for this subgroup in Appendix  1. A preferable strategy might have been to control for mean tenure within a firm (or even better tenure within an occupation within a firm) as an indicator of expected job duration; this information is, however, not available within the data set. Before matching, our base sample consists of roughly 10,000 persons taking up a subsidized and 170,000 persons taking up an unsubsidized job. In West Germany, around  3% of all hires in the sample were subsidized; more than  10% were subsidized in East Germany. The mean actual duration of subsidization amounted to  4  months in West Germany, to  5  months for men in East Germany and to  6  months for women in East Germany. We do not have individual information on the size of the subsidy, but information merged through cost accounting at the local level indicates that the average daily subsidy amounted to about  20  Euros, with average costs of subsidization around 2,500  Euros in West Germany up to more than 3,000  Euros for East German female workers. Table  3 in the Appendix presents mean values of the variables underlying the propensity score matching before the matching took place. Mean characteristics of workers taking up subsidized or unsubsidized employment, respectively, differ partly: a)  Regarding socio-demographics, workers supported by a subsidy have over-proportionally received unemployment assistance compared to those who took up an unsubsidized job; differences are rather small regarding further features. b)  Looking at the job characteristics, more of those in subsidized jobs are occupied in a white collar job, less often in a manufacturing occupation. c)  Subsidized employment relationships are found comparatively more often in urban labor markets with high or medium unemployment as well as in rural areas with below average unemployment. d)  Rather strong selectivity effects seem to exist on the firm's side. Subsidized employment can be found over-proportionally in small firms and in branches such as sales and data processing, R&D and other economic services. A much higher share of unsubsidized than of subsidized workers takes up work in the construction sector, in hotels and restaurants, as well as in temporary help. Furthermore, subsidized workers are less often found in high wage firms. e)  Turning to the individual labor market history, those who took up a subsidized job have participated more often in another labor market program during their current unemployment spell and had been unemployed for longer than those who found a job without the help of a subsidy. During the years preceding their unemployment spell, they have spent less time in employment and more time in unemployment. Also, the share that had already participated in labor market programs and had experienced sickness periods is significantly higher. Taken all together, differences between subsidized and unsubsidized workers seem to manifest themselves mainly in the labor market history of workers (less in their socio-demographic characteristics) and in the selection into smaller firms within particular branches. To convey an impression of the unconditional wage distributions, Fig. 1 shows kernel estimates of the distribution of daily starting wages for the four groups under consideration. Average daily starting wages are found in the first column of  1a) in Table 2, which presents the main results of the wage analysis. Before matching, the mean starting daily wage after taking up the job  (1a) is significantly lower for subsidized workers across all four groups investigated; the difference is around twice as large in West Germany (around  4 to  5  Euros) than in East Germany (around  2  Euros). As is usually found, wages are higher in West than in East Germany and higher for male than for female workers. It is noteworthy that average wage rates are rather low for our entire sample of previously unemployed individuals, and in particular for subsidized workers: Rhein and Stamm (2006) utilize the same data base underlying our wage information, the employment history files (BeH), to estimate the low-wage threshold for Germany, defined as two thirds of the median wage rate of all employment relationships observed at June  30. For the year 2003, the threshold amounted to a monthly wage rate of 1,772  Euros in West and 1,273  Euros in East Germany. Assuming that a month has  30 days, this corresponded to a daily wage rate of  59  Euros in West and  42  Euros in East Germany. Thus, in our sample, subsidized male workers in West Germany (62  Euros) are on average just above the low-wage threshold, while female workers  (49 and  39  Euros, respectively) are generally found below, and only male workers in East Germany (51  Euros) earn on average considerably more. Full sample: Kernel estimates of the distributions of daily wages directly after taking up the job. ∗ Significant at α \( = \) 0.05, ∗∗ Significant at α \( = \) 0.01. Note: Previously unemployed workers taking up a  full-time job during the second quarter of 2003. Comparison persons have been selected by means of a  radius matching and a caliper of 0.0005. Subsidies include subsidies for training requirements as well as subsidies for hard-to-place workers. With the exception of the first subsidized employment spell, only times in unsubsidized employment are considered. Regarding the matching results, the mean standardized bias (MSB; given in the last rows of Table 2) between the two groups of workers decreases considerably through matching, indicating a very good quality of the comparison group. Furthermore, t-tests on equal means between treatment and comparison groups after matching could not be rejected after matching at \( \alpha \) \( = \) 0.05 for any variable and any sample presented in Table  3 in Appendix  1 (variable means after matching are shown in Table  O.1 in the electronic supplementary material). After the matching took place, the differences in starting wages decline considerably and remain significant only for East German men. Thus, unconditional wage differences between subsidized and unsubsidized workers can mostly be explained by the characteristics of the worker, the local labor market and the firm. Results are similar if we take a look at the mean daily wage during days of employment in the  3.5  years after taking up the job  (1b). However, if we compute the average of daily wages across these  3.5  years, assuming zero wages for days without employment  (1c), we find that subsidized workers earn  2 to  4  Euros more per day than their unsubsidized counterparts after matching. The underlying reason is depicted in Fig. 2: The share of subsidized workers in regular employment is usually higher during the observation period than the share of unsubsidized workers. In particular, during the first months in employment, subsidized employment relationships are more stable than unsubsidized ones (see also Ruppe 2009; Jaenichen and Stephan 2009) and seem to be less subject to seasonal adjustments – even within the same branches. While differences in employment shares are only partly significant in West Germany, they are quite substantial in East Germany. The aforementioned “protection period” might be an important reason for longer job durations of previously subsidized workers. Furthermore, we cannot preclude the possibility that firms hire subsidized workers in particular in jobs that are characterized by on average longer tenure, thus selection may still play a role on the firm's side. Full sample: Share of subsidized workers and matched comparison persons in employment as well as difference in shares. In a next step, we compare the wage rates described above with appropriate “counterparts” that workers had received before their unemployment spell, to cancel out time-constant unobserved individual heterogeneity among workers that might have remained after matching on observables. 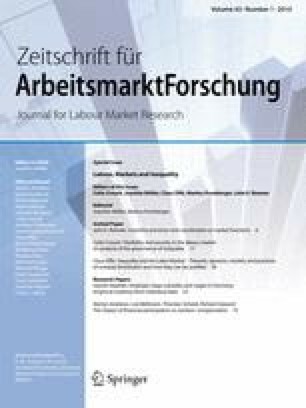 If we compare the starting wage with the last wage earned before unemployment  (2a), we find that subsidized workers – compared to all other newly hired workers – have experienced a significantly larger mean gain in daily wages, ranging from about  1 to nearly 4  Euros in the four groups investigated. However, compared to the selected comparison group of unsubsidized workers, the difference vanishes and turns – while small – even significantly negative for male East German workers. Results for the matched sample are similar for mean daily wages of subsidized and similar unsubsidized workers, cumulated over longer periods  (2b). Comparing mean wages over these time periods and imputing wages of zero for days without employment, we find a mean wage gain of subsidized compared to all unsubsidized workers  (2c) of about  6 to 9  Euros. Again, restricting the comparison to the matched counterparts, differences remain mostly significant and amount to roughly  3  Euros. As has been mentioned, although we control for important firm characteristics, selection on the firm's side might still be an issue. Thus, the entire analysis has also been replicated for individuals taking up a job in a firm that has hired at least one subsidized and one unsubsidized worker. As has been discussed in Sect. 4, this step controls for unobserved firm heterogeneity, but might induce unobserved heterogeneity on the workers side. Mean wages of newly hired workers are generally lower within this group of firms than in the full sample, and in particular they are lower for workers hired without a supporting subsidy. The main results of this step are presented in Table  3 (descriptive results) and  4 (matching results) in the Appendix. Before matching, subsidized workers within these firms seems to experience significant positive wage gains. But again, differences in daily wages do not remain significant after the matching took place, and we find wage gains for subsidized workers during the  3.5  years after taking up the job, when we assume zero wages for days without regular employment. For robustness checks (that can be found in Table  O.2–O.4 in the electronic supplementary material), all estimates have also been conducted for individuals who did not enter any (other) labor market program during their unemployment spell. Results are very similar to those presented above (effects on cumulated wages are slightly smaller). Furthermore, we separately repeated the estimates for subsidies directed towards training requirements and subsidies for hard-to-place workers. As could have been expected, average daily wages are lower – by up to  10  Euros – for individuals receiving a subsidy for hard-to-place workers than for those receiving one for training requirements. While their average employment shares over time are also lower, the difference in employment shares compared to a matched comparison group is higher, which indicates a higher effectiveness of the program for individuals with more severe obstacles to reintegration into the labor market. Regarding wage differences between subsidized and similar unsubsidized workers, we find again nearly no significant differences after matching for both variants of the subsidy. Finally, although this is not the main topic of our paper, a simple fiscal cost-benefit analysis for subsidized workers is presented in Appendix  2. This enables us to get a very rough impression of the efficiency of the subsidy. While the findings should be interpreted with care, they indicate that wage subsidies – because of on average higher subsequent employment shares of participants – might be self-financing over the longer run if adverse indirect effects (depicted in detail in the Appendix) are not too large. For Germany, this paper investigates a sample of new hires during the second quarter of 2003 and asks how subsequent wages differ between workers who took up a subsidized or unsubsidized job, respectively. The most important wage subsidy programs in the time period under consideration granted time-limited supplements to firms that hired hard-to-place workers or hired workers into jobs with particular training requirements. Within the legal framework, the size and duration of these subsidies were negotiated between caseworkers and firms. To present first results on the wages of workers supported by such a subsidy, we use a large process-generated data set, providing information on individual, regional and firm characteristics as well as on wage rates received during a previous period. We compare their wages with those of unsubsidized workers. In a first step, to account as far as possible for observed heterogeneity, we selected a comparison group by means of a propensity score matching. In a second step, to cancel out time-constant individual heterogeneity, we combined this with a difference-in-differences approach, focusing on the wage development of individual workers before and after taking up the new job. As a first main result of the study, we find no significant wage differences between subsidized and similar unsubsidized workers, and the difference in individual wage changes is mostly insignificant as well. Thus for Germany, our study does not obtain evidence of rent-sharing between workers and firms to exploit the schemes under consideration, or for comparatively low wages in subsidized jobs. These results differ from those obtained in studies of North American wage subsidy schemes. It seems that wage effects of wage subsidies seem to hinge crucially on the design of the subsidy scheme and on the institutional setting. Our main explanation for similar short-run wages of subsidized and unsubsidized workers is that the German system of wage setting is shaped by collective contracts and an attachment of wages to jobs rather than to individual abilities: The ubiquity of collective contracts implies that lower or higher wages for subsidized workers than for unsubsidized workers within similar jobs and within the same firm might first not be feasible (if the firm is covered by a collective contract and the worker is unionized) and second and even more important, be assessed as not acceptable or unfair, respectively, by workers, firms' management and also by caseworkers. This should hold in particular regarding wage-undercutting because subsidized jobs are on average rather low-wage jobs. Furthermore, the German scheme did not involve vouchers, which might have helped to avoid stigma effects. As a second main result of the study, initially subsidized workers subsequently have higher employment rates, resulting in significantly higher cumulated wages during the time frame investigated. If we aggregate these higher wages due to higher employment rates over the observation period of  3.5  years, additional earnings of subsidized workers sum up to around 2,200  Euros (women in West Germany) to 5,000  Euros (men in East Germany). The fact that firms might have to reimburse part of the subsidy if they dismiss workers during the “protection period,” might contribute to the higher employment shares of previously subsidized workers and thus to higher cumulated wages in the longer run. In a number of cases, these time periods seem to have been sufficiently long to close productivity gaps (or invalidate prejudices) that might have been existent when taking up the job. While these results are plausible, several caveats of the analysis have to be kept in mind, in particular regarding cumulated wage effects: First, the comparison with unsubsidized workers ignores the importance of the subsidy for hiring decisions, but interprets subsequently higher employment shares of previously subsidized workers as a causal effect of subsidization (or of the associated “protection period”). While we have compared wages of similar workers within roughly similar firms, an important issue is certainly to analyze the importance of the selection process of subsidized workers into particular firms in more detail. Firms with on average high tenure – that are confident that workers survive the “protection period,” which is associated with subsidization – are probably more likely to hire subsidized workers. Regrettably, we have no precise information on the latter variable. Second, the methods applied in this paper do not identify potential indirect effects of subsidization, such as displacement and substitution as well as effects on reservation wages; this would require a macro-analysis on the regional level. Finally, our study is restricted to program entries during the second quarter of 2003. Thus, another line for future research would be to analyze entries from a longer period of calendar time. In Deutschland können Unternehmen, die Personen mit Vermittlungshemmnissen einstellen, für einen begrenzten Zeitraum einen Eingliederungszuschuss zum Arbeitsentgelt erhalten. Dieser Beitrag untersucht die Einkommens- und Beschäftigungsentwicklung von vormals Arbeitslosen, die im  2. Quartal 2003 aus Arbeitslosigkeit heraus eine Beschäftigung aufnahmen, um zu überprüfen, inwieweit die Arbeitseinkommen gefördert und ungefördert eingestellter Personen differieren. Die Gruppe der Geförderten umfasst dabei Personen, die mit dem damaligen Eingliederungszuschuss bei Einarbeitung oder aber bei erschwerter Vermittlung gefördert wurden. Die Höhe und Dauer der Zuschüsse liegt – im Rahmen der gesetzlichen Vorgaben – im Ermessen der Arbeitsvermittler; sie sind typischerweise das Ergebnis eines Verhandlungsprozesses zwischen diesen und den einstellenden Unternehmen. Die Studie basiert auf administrativen Daten der Bundesagentur für Arbeit, die Informationen über individuelle, regionale und firmenbezogene Merkmale enthalten. In einem ersten Schritt werden die Löhne anfänglich geförderter Arbeitnehmer mit denen ähnlicher ungeförderter Personen verglichen, wobei die Vergleichsgruppe mithilfe statistischer Matching-Verfahren ausgewählt wird. Um zudem für zeitkonstante unbeobachtbare Heterogenität zu kontrollieren, werden im zweiten Schritt die Lohnentwicklungen der beiden Gruppen vor und nach der Aufnahme des neuen Arbeitsplatzes verglichen, also Matching-Methoden mit einer Differenzen-von-Differenzen-Strategie kombiniert. Ein erstes Ergebnis der Untersuchung ist, dass sich die Löhne gefördert und ungefördert eingestellter Personen kurzfristig nicht unterscheiden; dasselbe gilt für die Lohnentwicklung. Damit lässt sich für Deutschland weder Evidenz dafür finden, dass sich Unternehmen und Arbeitnehmer mögliche „Renten“ aus Lohnsubventionen teilen, noch dafür, dass geförderte Arbeitnehmer durch die Förderung „stigmatisiert“ werden. Studien für Nordamerika kamen teilweise zu entsprechenden Schlussfolgerungen. Dies weist darauf hin, dass die Effekte einer Förderung von deren konkreter Ausgestaltung und dem institutionellen Kontext abhängen. Eine Erklärung für die kurzfristig ähnlichen Löhne geförderter und ungeförderter Arbeitnehmer in Deutschland könnte die hohe Bedeutung kollektiver Verhandlungen für die Lohnfindung sein, bei denen das Arbeitsentgelt eher an den Arbeitsplatz bzw. die Leistungsgruppe als an die konkrete Person gebunden ist. Höhere oder geringere Arbeitsentgelte anfänglich geförderter Arbeitnehmer könnten daher erstens nicht durchsetzbar sein (wenn das Unternehmen einen Tarifvertrag anwendet) und zweitens von Arbeitnehmern, Firmen und Vermittlern als unakzeptabel oder unfair eingeschätzt werden. Dies dürfte umso mehr gelten, als die geförderten Personen vor allem Tätigkeiten im Niedriglohnbereich aufgenommen haben. Weiterhin wurden die Eingliederungszuschüsse nicht auf Gutscheinbasis gewährt, was dazu beitragen dürfte, Stigmaeffekte zu vermeiden. Ein zweites Ergebnis der Studie ist, dass anfänglich geförderte Arbeitnehmer in der Folge signifikant mehr Tage in Beschäftigung waren, was sich entsprechend in höheren kumulierten Arbeitseinkommen auswirkte. Aggregiert über den Beobachtungszeitraum von  3,5  Jahren betrugen die zusätzlichen Einkünfte etwa 2.200 (Frauen in Westdeutschland) bis 5.000 Euro (Männer in Ostdeutschland). Die höheren Beschäftigungsanteile der Geförderten und die damit einhergehenden höheren kumulierten Einkommen könnten mit einer Besonderheit der Ausgestaltung von Eingliederungszuschüssen zusammenhängen: Wenn der Arbeitgeber einen geförderten Arbeitnehmer während der Förderung oder einer noch einmal so langen Nachbeschäftigungszeit kündigt – ohne dass hierfür dringende betriebliche Erfordernisse vorliegen – kann er zur teilweisen Rückzahlung der erhaltenen Zuschüsse verpflichtet werden. Diese Zeitperioden scheinen vergleichsweise oft ausgereicht zu haben, damit anfänglich geförderte Arbeitnehmer vorhandene Produktivitätsdefizite (bzw. Unsicherheiten über ihre Produktivität) abbauen konnten. Während die Ergebnisse plausibel sind, sind einige Einschränkungen zu machen, die sich insbesondere auf die Wirkungen der Förderung auf die kumulierten Einkünfte beziehen: Erstens ignoriert der hier gewählte Ansatz, dass die Gewährung eines Zuschusses bereits einen Effekt auf die Einstellungsentscheidung haben dürfte, interpretiert aber die höheren Beschäftigungsanteile der Geförderten im Vergleich zu ungefördert einstellten Personen als Folge der Förderung (oder ihrer Ausgestaltung). Während dabei die Löhne ähnlicher Personen in ähnlichen Unternehmen verglichen wurden, sollte der Selektionsprozess von Arbeitnehmer in Firmen in Zukunft noch genauer untersucht werden. Insbesondere Firmen, in denen die durchschnittliche Betriebszugehörigkeitsdauer vergleichsweise lange ist, dürften eher davon ausgehen, dass ein geförderter Arbeitnehmer auch mindestens bis zum Ende der Nachbeschäftigungsfrist im Unternehmen verbleibt. Zweitens sind die in dem Beitrag angewendeten Methoden nicht geeignet, mögliche indirekte Effekte der Förderung (wie Mitnahmeeffekte, Verdrängungs- und Substitutionseffekte sowie mögliche Wirkungen auf die Reservationslöhne) zu identifizieren. Hierzu wäre eine Makroanalyse auf dem regionalen Niveau erforderlich. Schließlich beschränkt sich die Studie auf Zugänge in Beschäftigung während des 2. Quartals 2003. Weitere Auswertungen sollten prüfen, ob die Wirkungen einer Förderung auch für andere Zugangszeiträume ähnlich ausfallen. I  am grateful to Bernd Fitzenberger for making this point. Local rate hirings/unemployment in 3-digit-occ. * Only program participations in short-firm internal training that took place more than one month before taking up the job. Note: Excepted local unemployment rates for the 3-digit-occupation, all variables are categorized as dummy variables. Note: Previously unemployed workers taking up a  full-time job during the second quarter of 2003. Comparison persons have been selected by means of a  radius matching and a caliper of  0.01. Subsidies include subsidies for training requirements as well as subsidies for hard-to-place workers. With the exception of the first subsidized employment spell, only times in unsubsidized employment are considered. To get a very rough impression of the efficiency of the subsidy we present a simple fiscal cost-benefit analysis for subsidized workers. The analysis relies on several strong assumptions: First, we compare workers taking up subsidized and unsubsidized jobs and thus implicitly assume that the subsidy was not necessary for hiring (which may underestimate the benefits of the subsidy), but that the higher employment shares of previously subsidized workers are in fact a causal result of subsidization (which may overestimate the benefits). For the latter, we assume that we control for all relevant characteristics that determine participation in the program as well as wage rates. But due to data limitations, some selection on the firm's side might still be present. Second, the analysis does not take into account possible indirect effects like substitution and displacement of previously unsubsidized workers through previously subsidized workers. The latter effects do not necessarily have to occur; in the absence of subsidization subsequent mismatch might just have been larger. We estimate the direct fiscal net effect for previously subsidized workers by deducting the estimated amount of the subsidy from estimated savings in unemployment benefits and unemployment assistance as well as estimated additional employee- and employer-based social security contributions and taxes during our observation period of  3.5  years (assuming an interest rate of zero). We do not have individual information on the size of the subsidy, but information merged through cost accounting at the local level. Mean savings in unemployment benefit and unemployment assistance are computed from individual daily benefits at the beginning of the unemployment spell preceding the analyzed hiring. Fiscal savings and additional incomes are computed on the base of gains in mean daily wages  (1c) and mean daily wage differences  (2c) from Tables 2 and 4. Similar to Pfeiffer and Winterhager (2005), we assume that social security contributions and taxes constitute on average  50% of earnings. We neglect administrative costs of handling the subsidy and administrative savings from less future contact with the local labor market offices. As a result, Table 5 shows that – independent of the underlying estimates of savings and additional incomes – estimated fiscal gains amount to 1,600 to 2,000  Euros for men in East Germany and to 500 to 1,000  Euros for men in West Germany and women in East Germany over the observation period of  3.5  years. Estimates vary, however, strongly for female workers in West Germany (where caseloads were lowest), depending on the underlying specification. While the findings should be interpreted with care, they indicate that wage subsidies – because of on average higher subsequent employment shares of participants – might be self-financing over the longer run. Note: The analysis is based on the results from Tables 2 and 4. Daily subsidy rates are estimated from cost accounting at the local level. Savings in unemployment benefit and unemployment assistance are computed from individual daily rates received at the beginning of the unemployment spell. Social security contributions (employee and employer) and taxes are estimated to account for on average 50% of additional incomes. The fiscal net effect is given by: Savings in unemployment benefits and assistance \( + \) additional social security contribution and taxes – amount of the subsidy.